One of the great things about shopping in brick-and-mortar stores is the interaction with sales associates. Customers can ask about product features, sizes, and more. And to cap off their shopping experience, when customers finish checking out, they get the customary, “Thanks for shopping with us today.” This simple acknowledgment makes customers feel good and leaves them open to going back and shopping at these stores again. Despite the ease and simplicity of shopping online, ecommerce is a solitary experience for customers. For starters, there’s no sales associate on hand to immediately answer questions. But one way to recreate the feel-good brick-and-mortar checkout experience is to use thank-you emails or texts to show customers they’re appreciated. Saying thank you is more than just thanking customers for their purchase; it also about creating a customer experience that keeps them coming back for more. Here’s a look at why thank-you emails are so powerful in ecommerce, along with different examples of the types of emails you can send to build lasting relationships. People go to brick-and-mortar stores to browse, compare, pay, and then leave. To perk up the customer experience, stores use tactics like adding extra cashiers to checkouts during peak times, offering free samples for customers to try, and encouraging sales associates to walk around and help customers. As great as the in-store experience is, though, the customer/store interaction stops when customers leave. Sales associates generally don’t call customers afterward to see how they’re enjoying their purchases. Online shopping is changing this. Yes, browsing websites alone on a phone or laptop can be a solitary experience, but digital marketing makes it easier to go beyond the shopping experience to reinforce the budding customer relationship. help you mark key milestones in customers’ lifecycle. Thank-you emails are powerful because, when you know how to use them, they have the potential to turn occasional shoppers into repeat customers. Let’s dive deeper into when to send “thank you for your purchase” emails and what to include so you stand out and create an experience customers appreciate and trust. Timing is key. Know when to send your thank-you emails. With brick-and-mortar stores, when a customer buys something, they get a thank you from the cashier, and in some cases, their receipt also includes a thank-you note. That’s the end of the conversation until the next time the customer visits the store. Email gives you an extra advantage because you can send more than one email—different versions and types—to thank customers in different ways after their initial purchase. Here are a few examples of the types and the timing of thank-you emails you can send. This is one of the most important thank-you emails you can send because it sets the tone of your customer relationship. 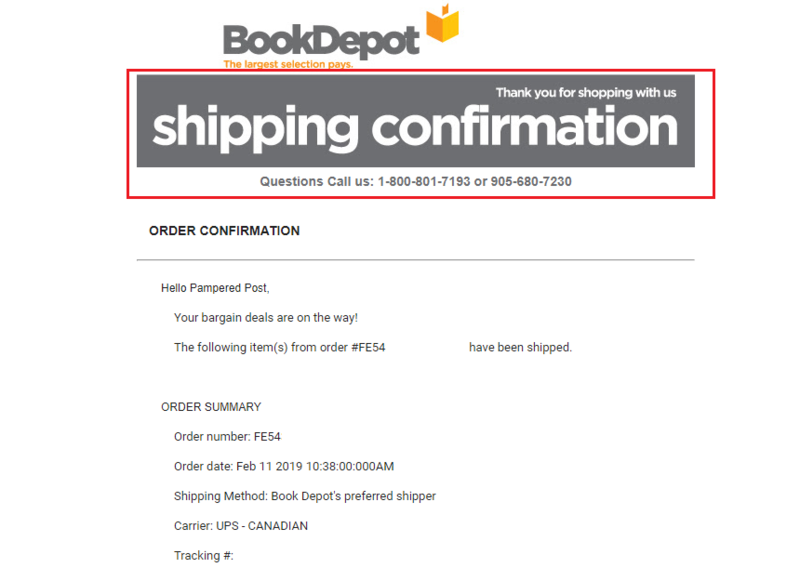 When customers get this email shortly after buying something, it sets them at ease because it confirms their purchase went through and it shows just how organized you are. Automate this email so you don’t have to manually send these every time. For example, connect a tool like Mailchimp to your store so that within a few minutes of purchasing, customers get an email confirming their purchase and thanking them for doing business with you. But remember, this thank-you email is more than a receipt. It should also include a summary of what was ordered, the shipping method, estimated delivery date, and confirmation number. 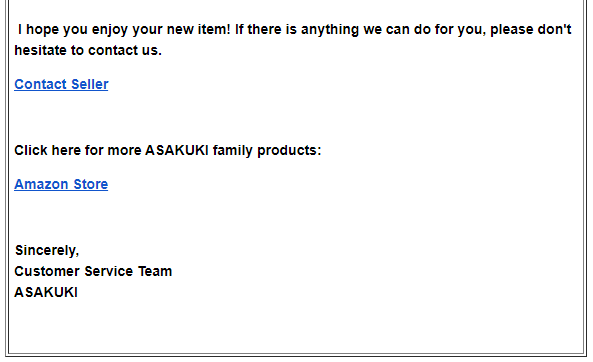 You can also include a thank-you not in shipping confirmation emails, like the one above. Also, get creative with how you format this email. Compared with general marketing emails, confirmation emails have a 70% open rate. Use this email to share more information about your company. For example, if you sell clothes online, include a section that says something like, “While you wait for your order to arrive, check out our latest blog post on summer fashion trends.” This gets customers back to your site and guides them to make future purchases. The key with this type of email is to not only say thank you but also include more content to keep customers engaged. They’re already happy about their purchase, so help them ride that high by directing them back to your store to experience more of what you have to offer. It’s confusing for an email subscriber when they sign up for a newsletter and never get confirmation their request to join went through. Until they get their first email from you, they don’t know what to expect. 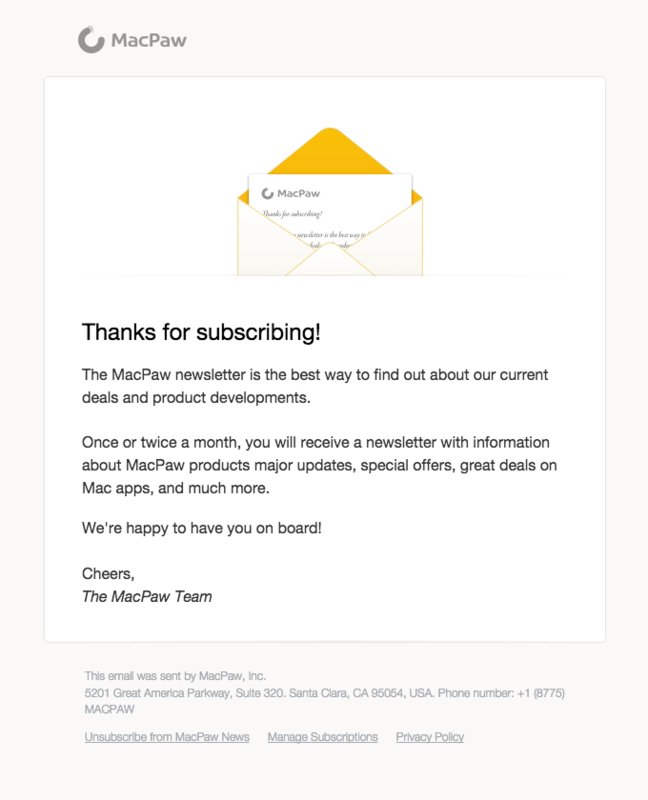 What the email above does well is list exactly what new subscribers should expect and how often they’ll get emails. This type of thank-you email is especially important if you have a lead magnet that offers to share content—like an ebook, infographic, or discount code. When subscribers sign up, send the content you promised as part of your thank-you email. Again, with the help of your email marketing software, these emails can be set up to send automatically. Drip campaigns can include anywhere from four to 12 emails that are sent over the span of a few weeks. For example, to avoid bombarding new subscribers after sending your initial thank-you email, space out the following emails to send every three to four days. That way, you’re sending gentle reminders about your value and inviting subscribers to head to your store, all without overwhelming them with information. 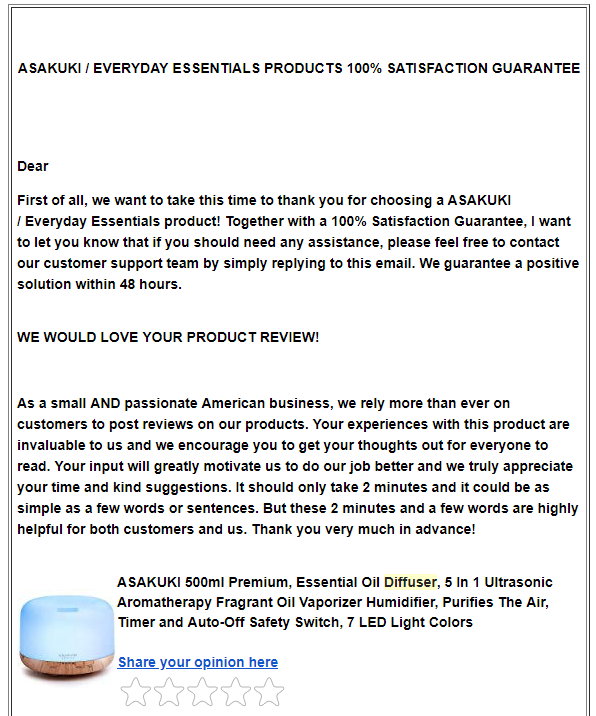 This type of thank-you email works for products that customers use regularly and need to replace a few times a year. For example, if you sell contact lenses online, customers will eventually need to buy more. 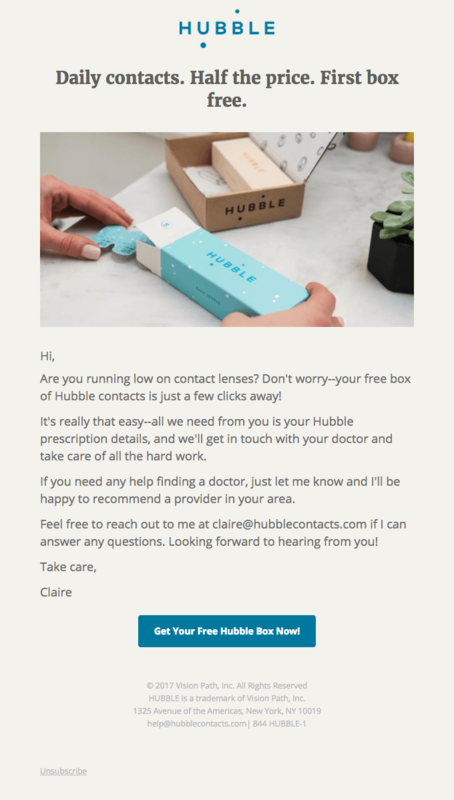 If you sell daily contacts that customers use once and then replace, and you sell them in 30- or 60-day packages, time your follow-up thank-you email with when it’s time for customers to refill their order. These reminder emails also work for subscription products that customers buy weekly or monthly. After customers receive their first mailing, send them a thank-you email that also checks in and asks for feedback, a review, or a testimonial. If you can get feedback early, you can make sure your campaigns and products keep meeting your customers’ needs and have a positive impact on their experience. Keep in mind that the timing of these reminder emails is critical. So that there isn’t a pause in your recurring revenue, you’ll want to send the reminders just before your customers’ product runs out. Customers will appreciate your proactive reminder to reorder and will be more likely to come back and shop again. Show your appreciation for customers by recognizing their achievements, regardless of how big or small they are. Customers like the recognition. Send a thank-you email with a discount code for customer anniversaries or birthdays, acknowledge customers when they buy a certain number of products, or thank customers when they refer new friends to your store. For this approach to work, you have to make sure your customer information is up to date. To do this, send annual email reminders to customers to update their customer profile. Or if your shop has a customer dashboard, post reminders there, encouraging customers to update their information. In this example, the seller also asks for a customer review and makes it easy for customers to follow through by including a link. If customers have a concern—the product arrived damaged, for example—respond quickly, and send a replacement. Just because the product arrived doesn’t mean that there should be less emphasis on managing the customer relationship. You want customers to trust you and come back to buy more. Solving customer issues can be stressful, but it’s an opportunity to reinforce that you’re a great company and that you value your customers. This attention to the specific needs of your customers goes a long way in improving customer experience because it turns a potentially bad situation into a positive one. A simple text message or plain-text email will get the job done, but it’s not exciting or creative. To make your thank-you emails more engaging, here are seven ways to get started. Plus, if done right, your emails stand a better chance of getting customers back to your store to browse—even if they’re still waiting for their ordered products to arrive. Use your brand colors. This makes your emails immediately recognizable and creates consistency. You build a sort of brand personality because it gives you a unique identity and creates an emotional connection with customers, both of which are helpful for creating custom customer experiences. Use images or GIFs. These draw the readers’ eyes to where you want them within the email. If your thank-you email includes a special offer, use an image or GIF to illustrate it. The majority of people are visual learners, so use that to your advantage by creating email content that caters to this characteristic. Keep the message short and to the point. Since people skim emails, get to the point quickly. Clearly say thank you at the top of the email, and add a few sentences explaining the reason for the email. Use a medium or large, dark font so your emails are easy for people to read. Nothing’s worse than having to squint to read text. This is a surefire way to get readers to close your email before they see the value. Include special offers or ask for referrals. Thank-you emails can serve dual purposes. If you’re sending an email after a purchase, use this opportunity while customers are still in a feel-good state of mind to introduce incentives to encourage them to buy something again. Plus, with referrals, you can expand your reach with very little work on your end. Your customers act as the driving force behind acquisition because they share their experience with their friends and family. Share content from your site to get customers to visit again. Thank-you emails don’t always have to market something. Improve customer experience by sharing blog posts that will help your customers solve issues they encounter. This is a simple approach, but it does a lot to show customers that you value them beyond just selling more products to them. Ask customers to follow you on social media. There are billions of users on social media. When you figure out which platforms your audience spends time on, invite them to join you there. Regularly post relevant content that shows your products, explains who you are as a brand, highlights what value you offer, and provides user feedback and experiences. Inject some humor. Have some fun saying thank you. Tell a story, share a joke—anything that helps you connect with your customers on a more personal level. Test different combinations of these suggestions to find what results in the most engagement from your customers. Are they sharing your emails with other people? Clicking through to explore the content you share? Be open to making changes to your thank-you emails so that customers are excited to do business with you. Thank-you emails are just the first step in creating a positive customer experience after a sale. They’re two words that carry a lot of weight, so take the time to find ways to show your customers that you appreciate them. Now that you’ve got a lot of ideas to get you started, experiment and track how your customers respond. You’re sure to see an improvement in customer experience and a boost in repeat sales.